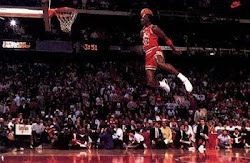 The NBA dunk contest has been one of my favorite sporting events ever since I watched the first one back in 1984. 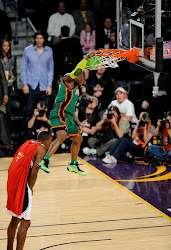 Since that time, the dunk contest has been an annual event at all star weekend. Below I have listed the winners of each year's contests. Some of these contests have definitely been more memorable than others. A few of them have been downright disappointing. 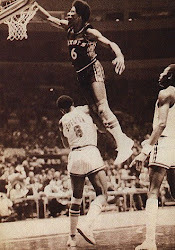 Dr. J set the standard for these contests. The battles between Dominique and Jordan were legendary. 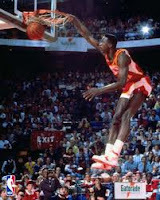 Spud Web, Kenny Walker, and Dee Brown were fun surprises winners. 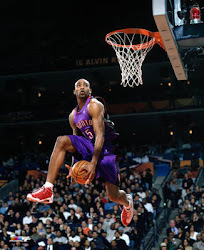 Jason Richardson pulled off some incredibly difficult dunks and Vince Carter's performance was perfect and revitalized the contest. I couldn't believe some of the people they chose to judge the contest in the early years. I remember Martina Navratilova and Joe Piscapo judging one year. 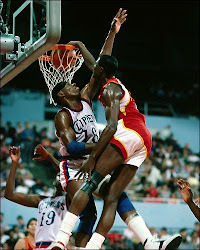 That make sense since they were both such seasoned dunkers...NOT! I'm glad past players and prior dunk champs judge now since they know what they are doing and can appreciate what the athletes do. In 2004 they changed the format to a 4 person contest and I don't understand why. 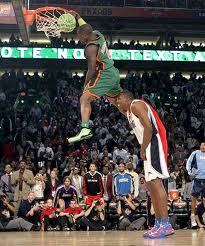 There are so many talented dunkers in the NBA so why would you want to limit the action and excitement? I'd prefer the way it was set up in the early days when you had many more participants. 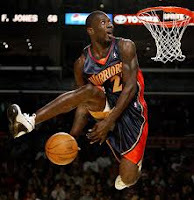 I'd even be happy if each team sent a player and they just did exhibition dunks in layup lines for 15 minutes as opposed to all the hype behind the limited action we now see. I'm also not a fan of props. I can understand if someone wants to put a sticker on the backboard, put tape down on the floor to show where they jumped from, or jump over a person, but we don't need phone booths, superman capes, or cars, and we really don't need gospel choirs marching out on the floor and singing before a dunk attempt. 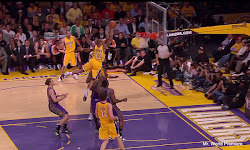 As much as I love Blake Griffin, last years contest was too much hype and not enough substance. I hope they don't pick up where they left off. 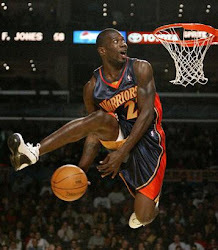 Also, if you are going to limit participation to just 4 players, why don't you pick the best dunkers in the league? I honestly think the NBA is trying to sabotage the event this year. I wish they would make some changes to the dunk contest since it has the potential to be one of the funnest and most exciting events of the year, but I find myself enjoying it less and less with time. Maybe I'm just getting old, but I doubt I'm the only one who feels this way. Thank you, I have recently been looking for information about this subject for ages and yours is the best I've discovered till now. But, what in regards to the conclusion? Are you positive concerning the supply? I'm really impressed with your writing skills as well as with the layout on your blog. Is this a paid theme or did you customize it yourself? Anyway keep up the excellent quality writing, it is rare to see a great blog like this one today. I'm really impressed with your writing skills and also with the layout to your weblog. Is this a paid subject or did you customize it your self? Either way stay up the nice quality writing, it is rare to peer a great blog like this one today.. I'm gone to say to my little brother, that he should also go to see this website on regular basis to take updated from most recent news. in it or something. I feel that you just can do with a few p.
It is really a nice and useful piece of info. I'm glad that yoou simply shared this useful information ith us.